Secure two planter boxes to your wide, wooden deck rail easily using these Achla Designs Brackets for 2 x 6 Rails. This package contains two sets of hardy, wrought iron brackets, which easily affix to your wooden, horizontal deck rail. The bottom of each bracket spans rails up to 5.625" in width, and the included hardware makes attaching them simple. The U shaped top of each support angles outward to 7.125" wide, for supporting your planter boxes up to 7" in top width. 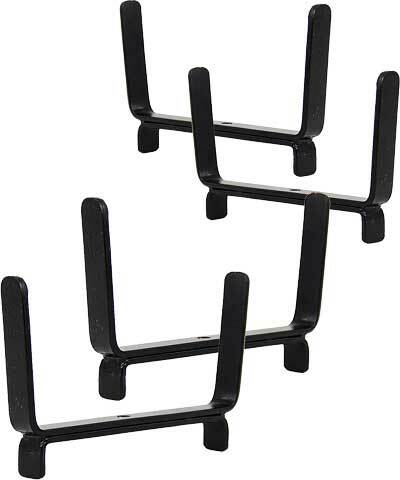 Space these brackets as desired on your railing, to perfectly hold two planters. Their black color offers a classic look, and the wrought iron construction remains durable for many seasons. Display two planter boxes on your wide deck rail with help from these Brackets for 2 x 6 Rails. Note: This package includes 2 sets of 2 Achla Designs Brackets for 2 x 6 Rails.